Many students, despite their strong undergraduate records and impressive Graduate Record Examination (GRE) scores, struggle once they enter graduate school. Underperforming graduate students may fail to complete their degree, settle for an M.S. instead of the Ph.D. they had planned on earning, or take longer than expected to finish [Golde, 1998]. Aside from the immediate emotional and financial stress these issues cause the student and adviser, there are long-term costs to both in terms of stalled publications, which slows down the scientific process and can negatively affect career progression. It is in the student’s and adviser’s best interests for a student to complete his or her degree in a timely fashion. The median time to finish a Ph.D. in the United States in physical and Earth sciences was 6–7 years between 1995 and 2015; thus, half of graduates took more than 6–7 years to complete their degree [National Science Foundation (NSF), 2016]. New recommendations by the National Academies of Sciences, Engineering, and Medicine  call for graduate education to shift its focus from one that serves the needs of institutions to one that serves the needs of students. With this in mind, graduate programs may benefit from integrating proven strategies based on extensive research on what drives success in undergraduate education. The Association of American Colleges and Universities’ Liberal Education and America’s Promise (LEAP) initiative, after just such an extensive research effort, has identified 10 high-impact practices that had a meaningful influence on undergraduate student success [Kuh, 2008]. I am an early-career faculty member at a primarily undergraduate institution that employs LEAP practices. As I integrated these practices into our programs, I often thought, “I wish I had something like this in graduate school; it would have helped me.” In that spirit, I am sharing here a discussion of LEAP practices in terms of how they are reflected in and could be used to improve graduate school programs in the geosciences. Graduate school curricula already include some of the high-impact practices recommended by LEAP, although they modify them for the advanced student. These practices include first-year seminars, common intellectual experiences, and learning communities [Kuh, 2008]. Moving through their first-year classes as a cohort develops a sense of community among graduate students who are adapting to the pressures and rigor of graduate school. First-year seminars bring groups of students and faculty together on a regular basis. Their aim is to immerse the students in their new university’s program and familiarize them with the faculty members as well as with cutting-edge research [Golde, 1998]. In graduate school, these first-year seminars are replaced with departmental seminars and laboratory meetings. Common intellectual experiences (a set of core classes that all students must engage in) and learning communities (requiring students to take core classes together) are often already embedded in many graduate programs as the set of core classes all new graduate students take during their first year. Moving through their first-year classes as a cohort develops a sense of community among graduate students who not only are adapting to the pressures and rigor of graduate school but may have also moved to the area from another state or country [Golde, 1998]. The foundational aspect of these classes also serves to ground the students in their new field of study and promote inquiry within the classroom. Through these learning communities, students become more comfortable discussing topics semester to semester, conforming to new modes of learning in graduate school [Kuh, 2008]. Three other high-impact practices are likewise already embedded in graduate school in the form of students’ dissertations: collaborative assignments and projects, research, and senior capstone course projects. 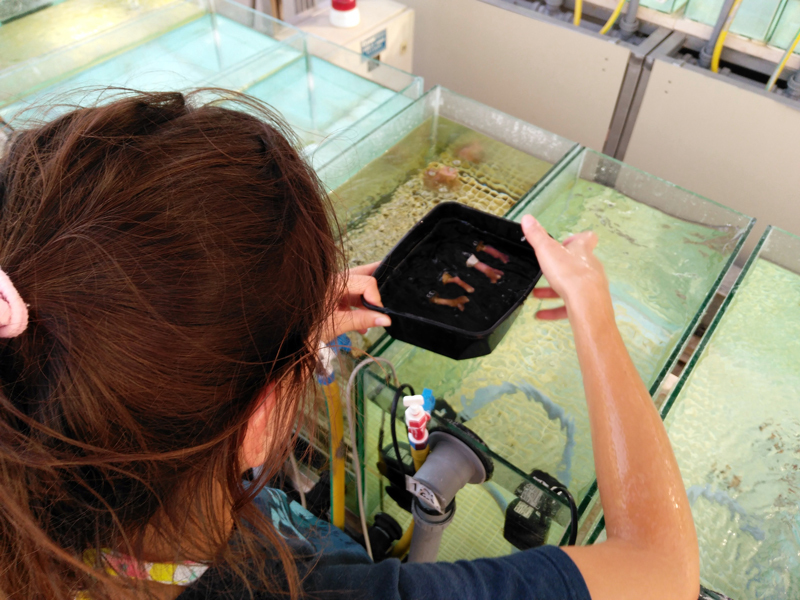 With the ultimate goal of writing a thesis, graduate students collaborate with other students, researchers, and professors to develop their ideas and troubleshoot problems, therein experiencing the collaborative nature of science. Research of both a physical nature (in the lab and field) and intellectual nature (through analyzing literature related to their topic) is required for a student to complete his or her thesis. This research process can mirror undergraduate research-based capstone courses that require the student to integrate knowledge acquired from several major courses. In fact, research has shown that students who participate in these practices as undergraduates are stronger students, and they may be more ready to adapt to the rigors of graduate school [Kuh, 2008]. The six high-impact practices described above are already commonly integrated into graduate school curricula. However, four of the LEAP practices have yet to fully make the transition into such programs. One of these less integrated practices is required writing-intensive courses. Although scientists usually distribute their findings in writing, geoscience graduate programs often do not require students to participate in formal science writing courses. Furthermore, undergraduate-level technical writing classes (unlike calculus, physics, or chemistry) are not typically recommended for incoming graduate students. Graduate students can be left in a sink-or-swim conundrum of figuring out how to prepare an article for a peer-reviewed scientific journal. Yet publishing manuscripts in a peer-reviewed scientific journal is at the core of graduate school education. This gap means that the only writing education that many science graduate students receive—particularly those who went to more technical schools—is the freshman composition classes they passed as undergraduates. These classes more than likely focused on writing papers about great literature rather than natural science. As a result, graduate students can be left in a sink-or-swim conundrum of figuring out how to prepare an article for a peer-reviewed scientific journal. A single preemptive course designed to guide students through writing their first article would increase the pace and quality of student writing, instead of making the students figure out all these steps on their own. Such a course would cover topics from choosing an appropriate journal to writing a cover letter for that journal to the nuances of writing the results and discussion sections. It could also illuminate best practices in writing grant applications and could even discuss some tips for writing geared to more public audiences. Graduate students and postdocs in one program at the University of Hawai‘i at Mānoa showed significant improvement in their confidence in grant writing after they received training on the topic. It is not unreasonable to assume that graduate students across the board would receive the same benefit from a similar class or a class specifically on research article writing. The need for an increase in racial and gender diversity in geosciences is currently a hot topic in the geosciences; LEAP identifies diversity (exposure to individuals of many identities ) and global learning (learning about other societal systems) as another high-impact practice [Kuh, 2008]. Institution-wide initiatives that encourage scholarship among women and minorities include Women in Science and Engineering chapters and mentoring programs, but these programs are often local in nature and sporadic across universities. Other extant programs expose graduate students to other cultures while developing their scholarship, such as the National Science Foundation’s International Research Experience for Students. Yet participation in such programs is not required in graduate school. Given the recent sexual harassment scandals in some programs, geosciences recruiting fewer minorities than other science and technology fields [Huntoon and Lane, 2007], and the knowledge that many students will pursue postdocs, research positions, and professorships abroad from their home country, it is in the interest of the scientific community to integrate diversity training and experiences in graduate school: the gauntlet through which most research professionals pass. Many universities in the United States already have a diversity office and Title IX coordinator, so graduate programs can reach out to those existing resources to determine the best ways to implement meaningful education about diversity issues in their programs. The last two LEAP high-impact activities that are not required in all graduate programs are service- and community-based learning and internships [Kuh, 2008]. The core idea behind both these activities is placing what students learn in school in context outside of that domain. Again, opportunities for internships within private and governmental sectors and calls for service learning, such as volunteering at science fairs, do exist. Graduate students often reject such opportunities, or their committees advise against them in the interest of progress on research. However, as the research organized by LEAP illustrates, the time these activities require is worth the benefit of a higher-achieving student [Kuh, 2008]. 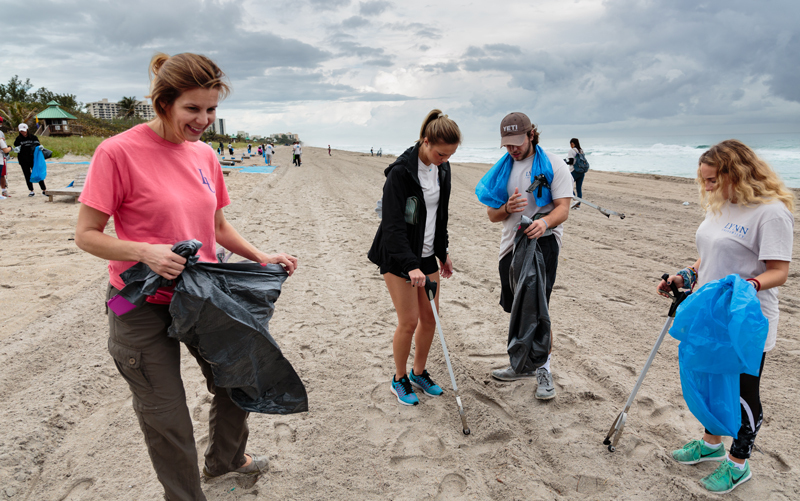 Students and faculty in this marine science and policy class at Lynn University participate in beach cleanups that foster later classroom discussion. Participation in service learning is a LEAP-identified high-impact practice. Credit: Juan Davila, © 2018, Lynn University, Inc.
Internships and service learning are known to be effective in developing awareness and knowledge among geoscience undergraduate students specifically [Liu et al., 2004; Blake et al., 2015]. It is not unreasonable to presume graduate students would also benefit from exposure to such opportunities. The high-impact practices identified by LEAP have been shown to induce statistically significant positive changes in learning as well as practical gains [Kuh, 2008]. These gains include the ability to synthesize information and its underlying importance, apply and analyze theories, make judgments about the value of information, and integrate ideas from various sources—all skills that would benefit graduate students [Nelson Laird et al., 2008]. Furthermore, these practices are effective for students across a broad diversity of incoming aptitudes [Kuh, 2008]. Many graduate programs already integrate some activities described in LEAP, but it is time for graduate programs to start to think about how to implement the remaining few. Blake, R. A., et al. (2015), Engaging undergraduates in the New York City S-SAFE internship program: An impetus to raise geoscience awareness, J. Geosci. Educ., 63(3), 176–184, https://doi.org/10.5408/14-040.1. Golde, C. M. (1998), Beginning graduate school: Explaining first-year doctoral attrition, New Dir. High. Educ., 1998(101), 55–64, https://doi.org/10.1002/he.10105. Huntoon, J. E., and M. J. Lane (2007), Diversity in the geosciences and successful strategies for increasing diversity, J. Geosci. Educ., 55(6), 447–457, https://doi.org/10.5408/1089-9995-55.6.447. Kuh, G. D. (2008), High Impact Educational Practices: What They Are, Who Has Access to Them, and Why They Matter, Assoc. of Am. Coll. and Univ., Washington, D. C.
Liu, L., A. R. Philpotts, and N. H. Gray (2004), Service-learning practice in upper division geoscience courses: Bridging undergraduate learning, teaching, and research, J. Geosci. Educ., 52(2), 172–177, https://doi.org/10.5408/1089-9995-52.2.172. National Academies of Sciences, Engineering, and Medicine (2018), Graduate STEM Education for the 21st Century, 174 pp., Natl. Acad. Press, Washington, D. C., https://doi.org/10.17226/25038. National Science Foundation (NSF) (2016), Doctorate recipients from U.S. universities: 2015, Arlington, Va.
Nelson Laird, T. F., et al. (2008), The effects of discipline on deep approaches to student learning and college outcomes, Res. Higher Educ., 49(6), 469–494, https://doi.org/10.1007/s11162-008-9088-5. —Alanna L. Lecher (email: [email protected]), Lynn University, Boca Raton, Fla.
Citation: Lecher, A. L. (2018), Helping geoscience students thrive in graduate school, Eos, 99, https://doi.org/10.1029/2018EO105415. Published on 11 September 2018.